The once unthinkable might become policy: negative nominal interest rates. Investors should care as they may be increasingly punished for not taking risks. Yet masochistic investors believe they may be the prudent ones given the risks lurking in the markets. What are investors to do, and what are the implications for the U.S. dollar and currencies? When investors deposit money in a bank, they are giving the bank a loan. Some investors aren’t so sure whether zero or close to zero percent interest compensates them for the risk of lending money to the bank, although FDIC insurance where applicable may alleviate that concern. But there are plenty of deposits that are not FDIC insured, such as money market funds. 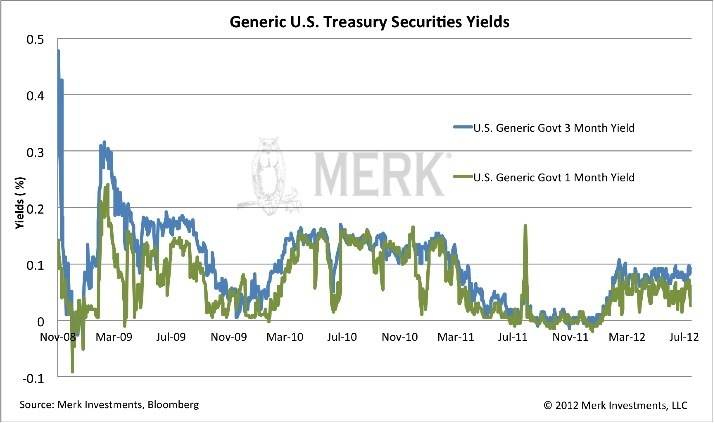 Such funds must invest in risky assets to cover their expenses and pay any yield; many prime money market funds have been chasing yields, investing in U.S. dollar denominated commercial paper issued by European banks (see Making the U.S. Dollar Safer: Return OF Your Money); money market funds reduced, but by far not eliminated the practice. Investors shall be forgiven for thinking that they do not get properly compensated for the risks they are taking on. August 23, 2011: Switzerland sold CHF 599 million 6-month bills at -0.1%, a negative yield for the first time for Switzerland. January 9, 2012: Germany sold EUR 3.9 billion 6-month bills at -0.0122%, a negative yield for the first time amid safe haven demand. July 9, 2012: France sold EUR 3.9 billion 3-month bills at -0.005%, a negative yield for the first time for France. July 16, 2012: The Netherlands sold a total of EUR 2.4 billion of 3.5-month Treasury Certificates at -0.041% and 6.5-month Treasury Certificates at -0.029%. July 17, 2012: Belgium sold EUR 1.5 billion 3-month bills at -0.016%, a negative yield for the first time for Belgium. July 17, 2012: The European Financial Stability Facility (EFSF), let’s call it a precursor to Eurobonds, sold EUR 1.488 billion 6-month bills at -0.0113%. U.S. Treasury sold $10 billion 5-year TIPS at -0.635%, a negative yield for the first time at a U.S. debt auction as investors bet the Fed may be successful in sparking inflation. U.S. Treasury sold $15 billion 10-year TIPS at -0.046%, with investors willing to pay a premium to guard against the threat of rising consumer prices. The negative yields on U.S. Treasuries dissipated once the Federal Reserve provided the loans to the ECB (there was one dissent at the time at the Fed, arguing that such swap lines are fiscal, not monetary policy and ought to be authorized by Congress). Anywhere in the world, the question of how to hold a currency becomes ever more important. When investors hold the U.S. dollar, do they hold cash on hand (good luck doing that with larger amounts)? Deposits in a bank? In money market funds? 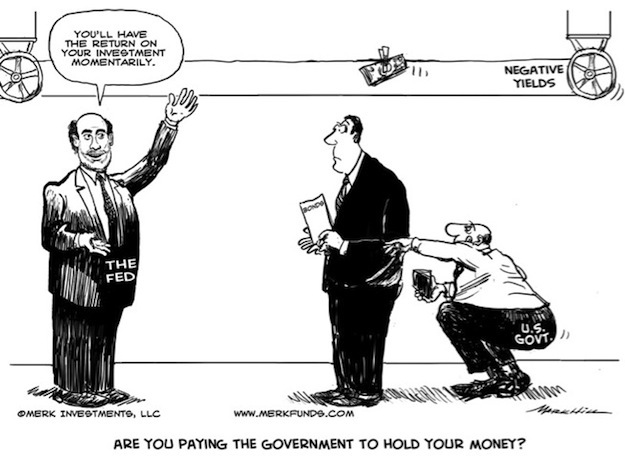 In U.S. Treasuries? Similarly, to the extent that one holds the euro, how do investors seek to hold the currency? In a German bank? In a Spanish or Greek bank? In a Spanish Treasury bill? In a German or Dutch bill? Should the euro break apart, one could buy a longer dated German security in the assumption that such security will be converted to a new Deutsche Mark and appreciate in value versus the current euro. We have argued since 2006 that there may not be such a thing anymore as a safe asset and investors may want to take a diversified approach to something as mundane as cash – the message is finally understood. This analysis might be most relevant for the countries not mentioned. Japan, the eternal low yielding country being the first that may come to mind. Indeed, in recent years, short-term Japanese Treasury bills were at times yielding a “high multiple” of those in the U.S. That is, they were yielding around 0.10% annualized, which was a high multiple of close to 0.01% in the U.S. during certain times. But Japan is taking the lead once again: in recent days, the Bank of Japan scrapped a 0.10 percent yield floor for government bond purchases, opening the door to the possibility of buying debt with negative returns. That is, for the first time, it may become central bank policy to endorse negative yields. Investors not interested in negative yields can look at other currencies not listed above. 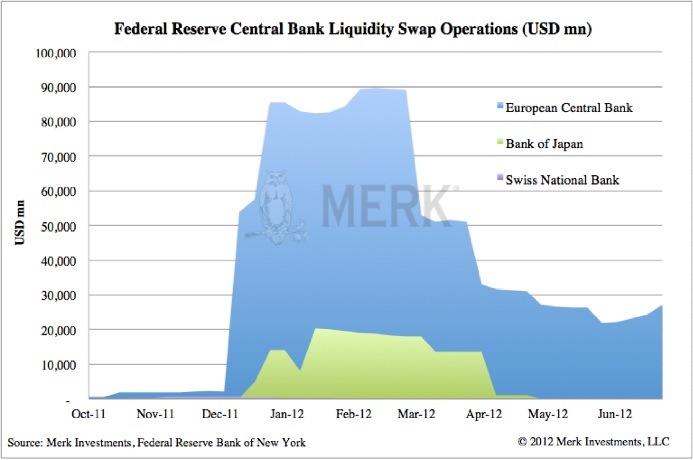 We favor currencies of countries that have higher rates not because we are interested in chasing yields, but because such countries may be more removed from the crises and thus be able to focus on sound monetary policy rather than subsidizing governments, banks or consumers. Alternatives are to buy riskier assets, such as equities; or invest in property, plant & equipment. Those are the types of activities central bankers would like to encourage us to do. But there’s also a good reason to accept the negative yields: there’s a saying that in a crisis, the winners are those that lose the least. Investors may have good reason to be on the sidelines, namely the belief that better prices may be available for riskier assets down the road. Central bankers are spooked by such attitudes, afraid of deflation; as such, they may be tempted with even lower rates, punishing savers. So get prepared for a negative interest rate environment. And we are talking about nominal rates only, before taking inflation into account.